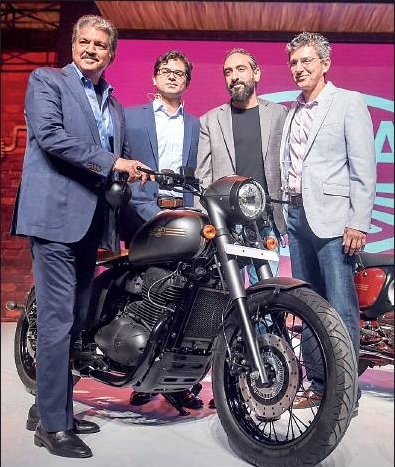 Reviving an iconic brand of yore, Mahindra and Mahindra’s two-wheeler subsidiary Classic Legends launched three Jawa-branded motorcycles, breathing life into a defunct Czech brand in India. Named ‘Jawa’, ‘Jawa Forty-Two’, and ‘Perak’, the motorcycles will be powered by 300-cc single cylinder engines and will have a base price of ₹1.55 lakh, ex-showroom Delhi. This puts them bang in the middle of the highly lucrative 200-500 cc capacity segment, which is currently dominated by Eicher-owned Royal Enfield, which enjoys a 90% market share. 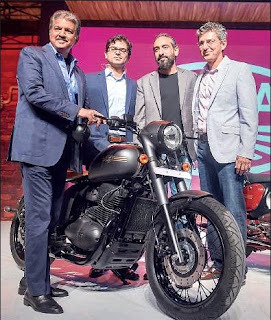 Unveiling the three bikes, Anand Mahindra, chairman of Mahindra and Mahindra, explained the thinking behind Jawa: “We want to be a company that wants to tell a story. It fits the Mahindra 2-wheeler business.”. The sales prospects of the mid-capacity motorcycle segment have attracted a lot of interest lately. Legacy brands such as Harley Davidson and Triumph have plans of launching products in this range to boost their portfolios. Overseas brands such as UM Motorcycles and Benelli and homegrown Bajaj Auto also have motorcycles in this segment. This is the Mahindra group’s second attempt at cracking the two-wheeler market in India. “This is the two-wheeler business. If we have a BSA brand, it will be (under) Classic Legends. This company will now be our two-wheeler business for India,” said Mahindra. BSA is an out-of-business British motorcycle brand that is now owned by Classic Legends with similar plans of bringing back to production. At the helm of the Jawa project was Anupam Thareja, founder of Classic Legends, who had prior experience in reviving legacy motorcycle brands. “He was instrumental in resurrecting the Enfield brand,” said Mahindra. The company has plans to open 105 Jawa showrooms across the country. While 64 of these will be operational from December 5, deliveries will only begin early next year.